Oh, the power of a humble little cookie. I work at CBC Radio and with all the government cutbacks over the last little while, morale is low. One Thursday a couple weeks ago, we were all bracing for yet another lay off announcement. But that morning – before the announcement – we couldn't help but smile. My colleague Niall got up early and made oatmeal chocolate chip cookies. He passed his "gratitude cookies" around with little napkins that thanked us for our hard work and said our work was valued. It was such a small thing but also such a big thing. It was a reminder that we are still doing good work and that people do care. Also, his cookies were really good -- warm and comforting in the way that only oatmeal cookies can be. 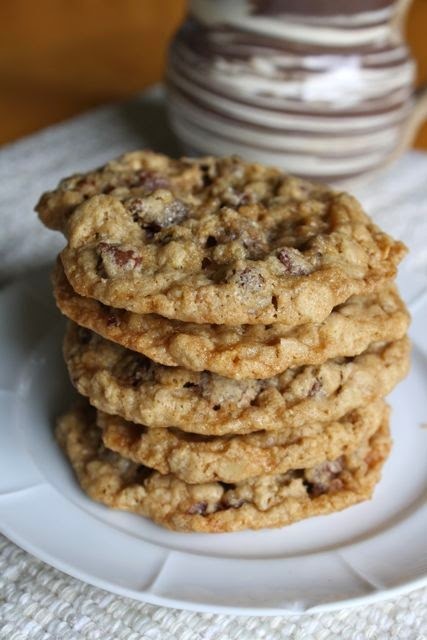 They reminded me how much I love making oatmeal chocolate chip (not raisin) cookies. 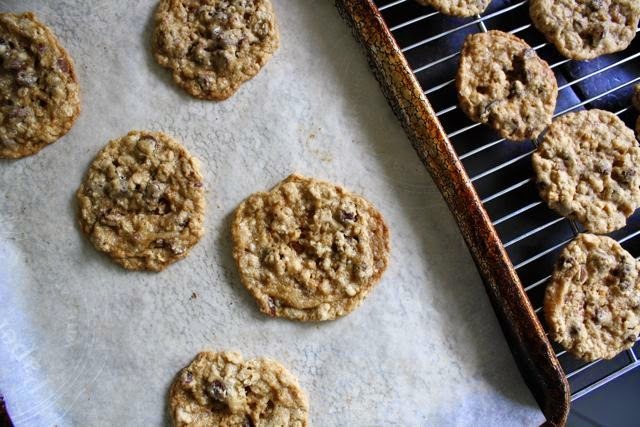 Now, making a chewy cookie gluten-free is not an easy feat. I dug out my favourite old Martha Stewart recipe, which I first came across back in 2004. You know, back when it seemed like Martha Stewart was the only reliable recipe provider on the whole world wide web? 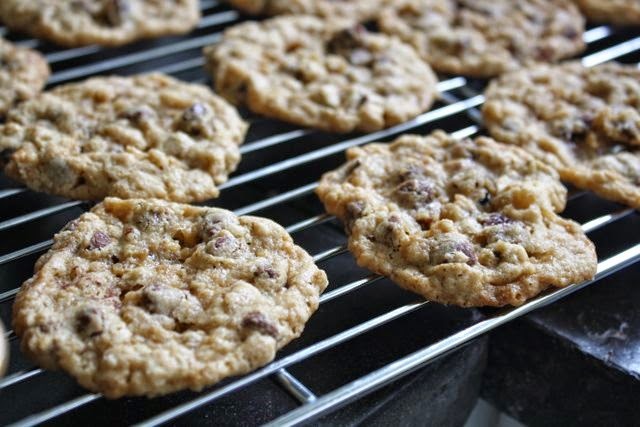 This recipe also has the added bonus of calling for dried cherries and toffee bits. I didn't have the toffee bits, but I did have a leftover piece of marzipan calling my name, so I grated it up. I pulled out my scale and weighed the gluten-free flours and hoped for the best . . . They baked up chewy and rich, full of comfort and chocolate and cherries and marzipan. A small victory, but I'll take what I can get. Preheat the oven to 350 degrees Fahrenheit and line your cookies sheets with parchment paper. Stir the flour(s), salt and baking soda together and set aside. Cream the butter and sugars until light and fluffy, about 2 – 3 minuets. Mix the egg in well. Follow with vanilla extract and make sure you scrape the sides of the bowl down. Slowly add the flour mix and stir until it's fully integrated. Stir in the oatmeal, cherries, chocolate and marzipan/toffee pieces. Divide the dough into 3 and use plastic wrap to roll 3 logs that are about 1 1/2 inches in diameter. Cut into 3/4 inch pieces and place fairly far apart on baking sheets. (I only put 6 on my regular cookie sheets because they like to spread.) If using gluten-free flours, chill in the fridge for at least 15 minutes. Bake until golden-brown, about 8 – 10 minutes. Let cool on the pan for a few minutes before removing to a rack. * I make oat flour by grinding rolled oats in the food processor. Make sure you use "pure" oats, which are not grown near wheat or contaminated in processing. ** You should find toffee pieces in a bag next to the chocolate chips at the grocery store. Those cookies look absolutely divine. I want to grab one out of your photo and eat it! yummmm!! And good work on getting them both tasty and gluten free.. But more importantly: you work for CBC radio?? I listen to it obsessively. I get legitimately excited to drive from Calgary to Edmonton by myself because it means 3.5 hours of uninterrupted radio listening. Not a comment on this recipe, but the raspberry bushes in the backyard are producing copiously all of a sudden, so I searched your site for a recipe and came up with Horse Turds. Looking forward to putting that one on the table this evening! Nancy, I think you will love it! There's something so refreshing about clouds of whip cream and marshmallow . . .